Lawyer salary - Lawyer firms NEWS - How much do layers make ? 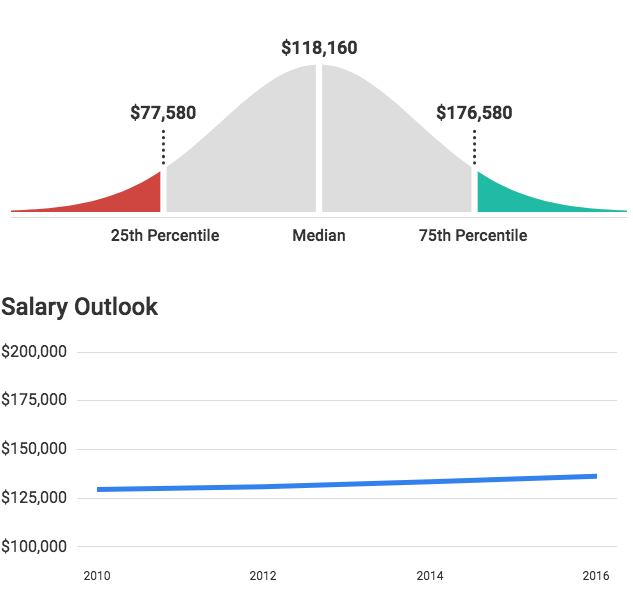 Find everything you need to know about lawyers salary by cities and states. Lawyers earned a median salary of $118,160 in 2016, according to the BLS. The best-paid lawyers earned $208,000 or more a year, while the lowest-paid made $56,910. What is the Outlook for Lawyers? The BLS projects 74,800 new jobs will open in the field by the year 2026. Attorney jobs are set to grow 9 percent by 2026, compared to 10 percent growth for other legal occupations. The law field is growing in a few areas. The BLS projects an increase of lawyers in the areas of financial and insurance firms, consulting firms and health care providers. The highest paid in the lawyer profession work in the metropolitan areas of San Jose, California, San Rafael, California, and Bridgeport, Connecticut. The San Francisco area also pays well, as does the city of Houston. The states and districts that pay lawyers the highest mean salary are the District of Columbia ($182,810), California ($162,010), New York ($161,260), Massachusetts ($158,760), and Delaware ($157,610). What is the Lawyer Salary by Place of Employment? In addition to region and education, factors such as specialty, industry and employer affect a lawyer’s salary. The top-paying industries with the highest average annual salaries for this career are scheduled air transportation ($214,630), industrial machinery manufacturing ($209,020), beer, wine and distilled alcoholic beverage merchant wholesalers ($205,500), semiconductor and other electronic component manufacturing ($196,380), and cable and other subscription programming ($195,270). An attorney employed by a large firm or private practice is likely to work more than 40 hours a week. Q: How much does a lawyer make per month? A: The median salary of a lawyer is approximately $9,847 a month, which amounts to $118,160 a year. Q: Do lawyers who own private practices or partners in law firms have a higher salary? A: Partners in law firms generally earn more than lawyers who own private practices. Lawyers earned an average annual salary of $139,880 in 2016, which is substantially more than the salary of any other occupation on our list of Best Social Service Jobs. For example, paralegals earned an average salary of $53,180 in 2016. Jobs with pay that is more akin to the salary of a lawyer include political scientists ($112,250), financial managers ($139,720) and actuaries ($114,120). Every lawyer who wants to do a thorough job should to hire a paralegal for the office. A paralegal is an essential employee who helps an attorney draft motions, summarize reports of legal precedent and serve as a legal assistant. A political scientist is a constant student of political theory. Political scientists use quantitative and qualitative data to understand how policies and laws of the day influence government, businesses and individuals. Financial managers have the responsibility of overseeing the finances of major companies, agencies and everything in between. Along with their teams, they coordinate accounting and produce financial reports, cash-flow statements and profit projections. Actuarial science is a discipline that uses mathematics, statistics and financial theory to measure, manage and mitigate financial risk and uncertainty. Actuaries are essential to the insurance industry, and they’re increasingly finding niches in other businesses.